Nova Mirage – Located just off Wongamat Beach this lowrise condominium is situated in one of the best kept beaches in the area. This stretch of beach has some of the best sand, cleanest water and stunning views of Pattaya’s Ocean, leaving you to feel in tranquility. 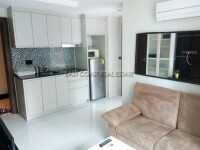 This studio unit is based on the 2nd floor and consists of up to 44sqm. It comes with a European style fitted kitchen, beautifully spaced out connecting to the bed and living area. The balcony is very big, with enough room to entertain guests and enjoy the views. The unit also comes fully furnished in the sale price.